1 Rinse gooseberries and drain. Halve large berries. 2 Whisk together the flour and baking powder in a mixing bowl. Add the quark, 4 tablespoons milk and the canola oil and knead with the dough hook of a hand mixer until smooth. 3 Roll out the dough on a lightly floured surface to a rectangle (about 30 x 40 cm) (approximately 12 x 16 inches). 4 Grate the marzipan on a box grater and sprinkle over the dough. 5 Mix together the gooseberries, breadcrumbs and cane sugar in another bowl, then spread on the dough, leaving the border (about 2 cm) (approximately 3/4 inch) uncovered. 6 Starting on a long side, roll up the dough firmly into a log. 7 Line a baking sheet with parchment paper, then place the log on top and form into a wreath. Pinch the ends together to help hold the shape. 8 Score the dough with a sharp knife with cuts about 5 mm (approximately 1/4 inch) deep in a zigzag manner. Brush with the remaining milk and bake on middle rack in preheated oven at 200°C (fan 180°C, gas mark 3) (approximately 400°F/convection 350°F) until golden brown, about 25 minutes. 9 Remove from oven, place on a wire rack and let cool slightly. 10 Squeeze juice from the lemon half. Whisk together 2-3 teaspoons lemon juice and the powdered sugar in a small bowl until smooth and thickened. 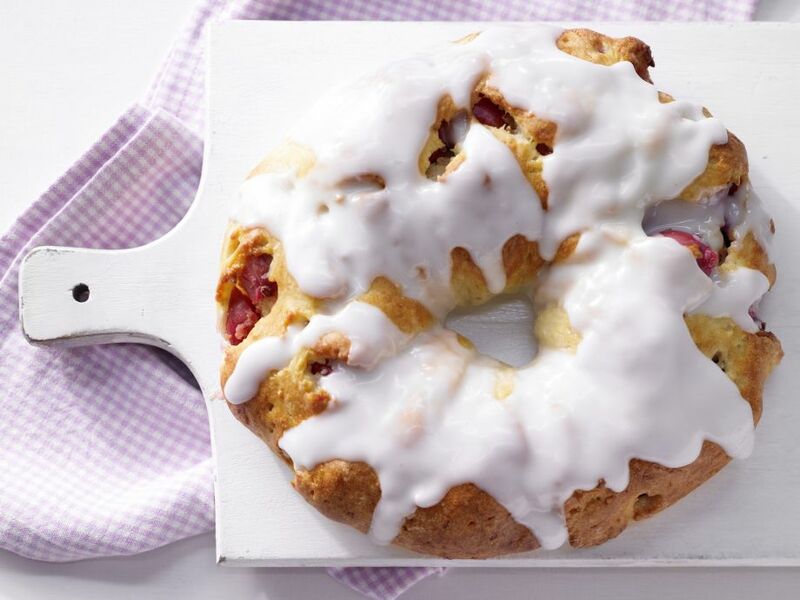 Drizzle over the lukewarm gooseberry wreath and let cool completely before serving.